If you are a master at the art of poaching eggs, you likely already have a solid idea of which egg poachers you prefer to use; however, if you are purchasing your first egg poacher set, there are several styles to consider, each with its own benefits. Here is a brief guide to the most popular egg poacher styles to assist you in selecting the egg poacher that is right for you. Nonstick egg poachers offer the greatest convenience when it comes to removing poached eggs from egg poacher cups with ease. Because of the nonstick finish, these egg poachers are also easy to clean. Many styles and sizes are available, such as a 2 egg poacher for singles or couples, or 4 egg poachers and 6 egg poachers for larger families. Nonstick egg poachers that come with removable egg poaching trays can also be used for other cooking activities, making them a cost effective option. For example, a Farberware nonstick 4 egg poacher that can also be used as a frying pan when the egg poaching tray is removed is around $20. 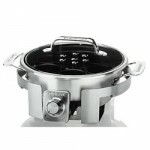 Electric egg poachers range in size, style and price, offering a wide variety of options for those looking for a convenient electric egg poacher that allows you to poach eggs without using your stove or microwave. For example, a Krups Egg Express Cooker that allows you to poach up to seven eggs at once is around $30, while a Cuisinart Egg Cooker with a 3 egg poaching tray is approximately $45. 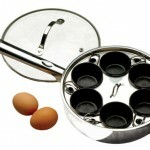 Stainless egg poachers are among the most popular stovetop options and allow for even heating and easy cleaning. Without a nonstick coating, buyers will want to use a cooking spray, butter or oil to ease poached egg removal. Also keep in mind that stainless steel egg poachers with glass lids will allow for easier monitoring during egg poaching. 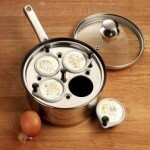 As an example, a Demeyere 7-inch 4 egg poacher set with a stainless steel saucepan, clear glass lid and easy to remove egg poacher cups with handles costs approximately $60. Microwave egg poachers offer a convenient, inexpensive option that can cut cooking time in half, but can be more difficult to master. You will probably not find a microwave egg poacher in the kitchen of a poached egg purist, but folks who are looking for a quick, convenient option or are not yet ready to spring for a stainless egg poacher, may want to try this alternative. Two examples of microwave egg poachers are the Nordic Ware microwave 2 egg poacher and the Progressive International 4 egg poacher, each of which are available for less than $10. 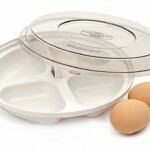 Silicone egg poacher options range from single silicone egg poacher cups to silicone egg poacher sets with multiple cups and a clear lid for easy monitoring. Removing a poached egg from a silicone egg poacher is as simple as running a spoon around the edge and these egg poaching cups allow for easy clean up. A set of two floating silicone single egg poacher cups from Fusion brands is about $10, or a Trudeau Double Egg Poacher for use in the microwave or a saucepan is about $15. Egg poachers come in a wide variety of styles and materials and include individual floating cups, egg poacher racks that are set inside saucepans and egg poacher cups with hooks that hang on the side of a saucepan. With a varied price range and some options that also function well for additional cooking activities, egg poachers are available for any budget and any size kitchen.